Several years back I was catching up with a friend who was in IT sales. It was late November and he’d already smashed his target by some margin. Despite his youth he was one of the top performers in his company – a massive business software company – and he was in a buoyant mood. As we chatted and joked about what we were up to he mentioned the results of his company’s latest customer satisfaction survey. This survey included a section on his clients’ evaluation of him personally and he was a little amused to find that they really didn’t like him. In fact he had scored a very poor level for likeability in the very account that had just signed off on the deal that had blown his target. It was a massive financial commitment for them and one that was a beacon within the industry. So why had they committed to this deal if they really didn’t like the person who’d sold it to them? After all, people buy people don’t they? That’s what all the sales books say. Well, yes and no. There’s certainly no harm in being liked. But it is more important to be valuable. And this is especially true when dealing with the c-suite. Looking at my friend’s customer survey results for “did they bring value” the answer was a resounding “yes”. And that ultimately is why they bought from him. It seems this idea (that have to be valuable more than you have to be liked) is gaining traction. The Challenger Sale supports this concept too. 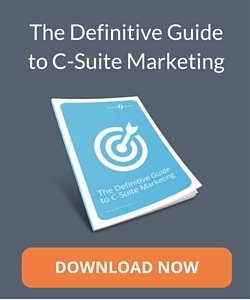 So the question for the c-suite marketer is “are you bringing value to the table”? Is the content in your messaging credible, insightful and different? Are there statistics in the copy? Are the statistics from a credible or trusted source? Are you endorsing the current opinion or bringing a fresh perspective?